f ever there was a busy boy, Thomas Edison, who was born in Milan, Ohio, was one. He wanted to do everything that he saw others doing, and more than that, he liked to contrive new ways of doing things. The grown-up people wished he would not ask so many questions or stay always at their elbows, watching their work. But it came out all right in the end, these busy ways of his, for to-day he is one of the world's greatest inventors. Thomas was a sunny, laughing, little boy, and pretty, too, except when he was trying to think how something was made; then he would scowl and pucker up his mouth until you would hardly know him. He always wanted to know how machinery worked and asked his father, or any one near by, to explain it to him. Sometimes his father would get all tired out answering questions, and to get rid of the little chap would say: "I don't know." Then Thomas would stare at his father and say: "You don't know! Why don't you know?" Then, if Mr. Edison did not answer, Thomas would perhaps run down by the water, along the tow-path for the canal. There were shipyards by the water, and he would pick up the different tools and ask the workmen what the name of each was, how it was used and why it was used, and get in their way generally until they drove him home. He built fine houses and tiny villages, with plank sidewalks, from the bits of wood these ship-builders gave him. The belts and wheels in the saw and grist mills pleased him. He watched them often. Once, in one of the mills, he fell into a pile of wheat in a grain elevator and had nearly smothered before he was found. Several times he fell into the canal and came near drowning. When Thomas was six years old, he watched a goose sitting on her eggs and saw them hatch. He wanted to understand this strange thing better, so he gathered all the goose and hen's eggs he could and made a big nest in his father's barn. Then all of a sudden, he was missing. The family rushed to the canal, the village, and the mills, and finally found him sitting on the nest of eggs in the barn. He wanted to see if he could hatch those eggs out! The only person who did not get out of patience with Thomas was his mother. He and she adored each other. She had been a school teacher and was used to children. She saw that Thomas had a keen mind and was always ready to explain things to him. When he went to school, the teacher did not know what to make of his strange remarks and almost broke Thomas's heart one day by telling the principal that she thought the little Edison boy was "addled." Thomas ran home crying. He could not bear to go again to the school, so his mother taught him at home. He had a wonderful memory and must have paid close attention to what was said, for he never had to be told a thing the second time. Thomas quite often had his lessons with his mother on the piazza. They seemed so happy that the children who went to school often wished they could study with Mrs. Edison. She was fond of children and was apt to run down to the gate with some cookies or apples for them. Sunny days Thomas liked to go with his father and mother into a tower Mr. Edison had built near the house. It was eighty feet high, and from its top one could see the broad river and hills beyond. At the age of nine, Thomas was more fond of reading than of playing. When he was twelve, he got the notion in his head that it would be a fine thing to read every book that was in the Public Library in Detroit. He kept at it for months! But when he had read every book on the first fifteen feet of shelves, he saw that some were very dry and stupid and gave up his plan. After that he chose the books that told of interesting things. When Thomas was eleven, he felt he ought to be doing something besides reading. He wanted to earn some money. His mother did not agree with him, but after he had teased for whole weeks, she said: "Well, you may try working part of each day." He sold papers and candy on the trains running between Port Huron and Detroit. At first Mrs. Edison was very nervous. She imagined that perhaps his train was getting wrecked, that he had fallen under the wheels of the engine, and all sorts of horrid things, but as he kept coming back home every night, safe and happy, she stopped worrying. He was bright, and the men who talked and laughed with him paid him a good deal of money for the papers and the nuts and candies which he carried in a basket. He was a proud boy to hand over to his mother the earnings of a week, which sometimes counted up to twenty dollars. Thomas was such a very busy person that the lessons he had with his mother early in the mornings and his paper work on the train were not enough to satisfy him, so he bought some old type, a printing-press, and some ink rollers, and began making a little newspaper of his own. This newspaper was only the size of a lady's pocket-handkerchief, but it was so clever that he soon had five hundred subscribers, and he made ten more dollars a week on that. The great English engineer, Stephenson, was traveling on Thomas's train one day and was so pleased with the paper that he bought a thousand copies. He said there were many newspapers edited by grown-up men that were not one half as good. Remember about this paper, and if ever you see Thomas Edison's beautiful home at Orange, New Jersey, ask to look at a copy of it. Mr. Edison thinks as much of it as of anything in the fine library. Well, Thomas's business on the trains grew so that he had to hire four boys to help him. Then he bought some chemicals, and in one corner of the baggage car, in spare moments, he began trying experiments. He was just getting hold of some pretty exciting ideas, when one day the train ran over something rough and spilled a bottle that held phosphorus. This set the woodwork on fire, and while poor Thomas was trying to beat out the flames, the conductor, in a rage, threw boy, press, bottles, and all off the train. And that was the end of the newspaper. The next thing to interest Thomas was the system of telegraphing. He had not lost the habit of asking questions and quizzed the operator at Mt. Clemens, Mr. McKenzie, every chance he had. As he stood on the station platform one day, asking Mr. McKenzie something, he noticed the operator's little child playing on the tracks right in front of a coming train. And that train was an express! Thomas rushed out and seized the child just as the train almost touched his coat. Mr. McKenzie was so grateful that he said: "Look here, I want to do something for you. Let me teach you to be a telegraph operator." Thomas was delighted and after that used to take four lessons a week. At the end of three months he was an expert. Thomas could not have learned so quickly if he had not worked very steadily. He always put his heart and mind on whatever he was learning, and he did not sleep more than four or five hours at night all the time he was studying the dots and dashes that are used in sending telegraph messages. 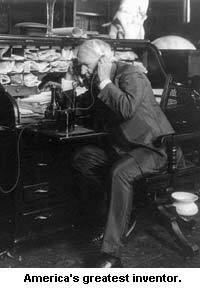 At the age of sixteen, Thomas Edison took his first position as telegraph operator. He did not earn very much at this work, at first, and usually tried to get places where he had night hours. This was so that he would have part of the daytime to read in public libraries and to try experiments. There were so many wonderful things to learn or to understand in this world that it was a pity, he thought, to waste much time in eating or sleeping. When Thomas was twenty-two, he had made his ideas worth three hundred dollars a month. Probably the school teacher who thought the little Edison boy was "addled" never earned that much at any age! From that time until now Thomas Edison's experiments have meant a fortune to him and no end of pleasure and comfort to the world. You cannot go into a city in the United States that is not fitted with electric lights--Edison lights. When you hear a phonograph, remember it is an Edison invention; when you go sight-seeing in a new city, the guide of the motor carriages will shout the names of places to you through a megaphone,--another Edison idea. He has patents on fourteen hundred ideas. No wonder he has had to keep busy! There is no telling how many more patents his brain will win, for he is only sixty-seven, and that is young in the Edison family. Thomas's great-grandfather lived to be a hundred and four, and his grandfather lived to be a hundred and two. And he himself is just as busy to-day as he was when he drove every one but his mother nearly crazy with his questions. Only to-day he stays in his workshop, getting answers to them. He never loses his interest in telegraph matters; many of his inventions have been along that line. In fun, he called his first girl and boy "Dot" and "Dash." And in that fine home in New Jersey, hanging near the funny little newspaper, is a picture of Thomas Edison when he sold newspapers on the train and sent telegraph news about the great Civil War to all the stations along the way. The picture shows a bright, merry face. America's greatest inventor still laughs like a boy and takes a day off now and then for music, fishing, and reading. But he is the busiest man living.